Who is excited for a Summer filled with sun, sand and holiday fun! 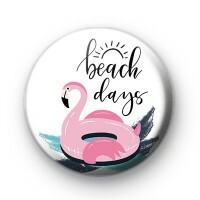 This badge has a cute pink flamingo with the text beach days written in a pretty script font. This badge would make the perfect handmade addition to your holiday / vacation bag! Now all we need now is some sun, sand & sea.